Let me lay my cards on the table right at the offset – I don’t like vans. I’ve always thought they’re slow, heavy, thirsty, a pain to drive, a pain to park and ugly. Can the latest incarnation of the Mercedes Vito Sport convert me back to van ownership with its car-like charm and surfboard friendly load bay…? The Sport is essentially the non-builder version of the popular Mercedes Vito model. It comes fully equipped with plush carpets, electric everything, air conditioning, cruise control, tinted rear windows, Bluetooth hook up, high performance audio unit with auxiliary input and alloy wheels. 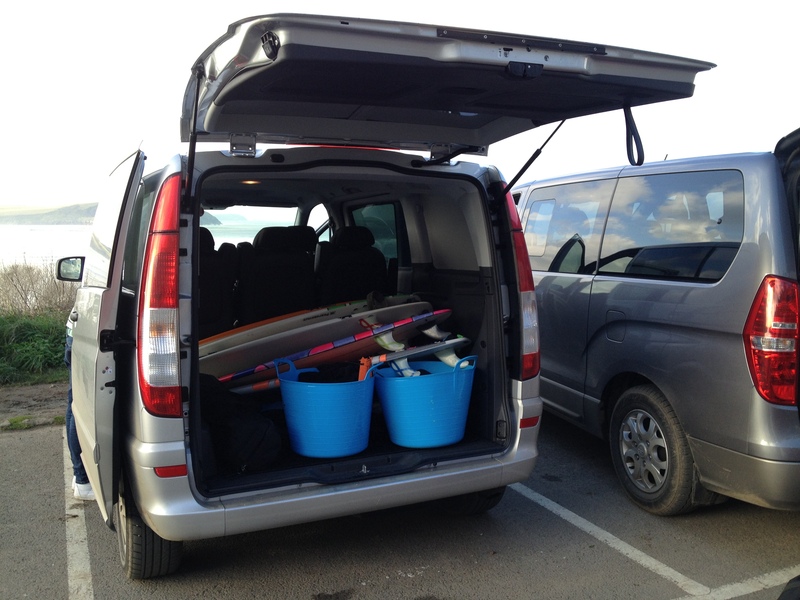 Check out the website for the full specification list, but this van comes fully loaded with all the right toys. The body comes in two choices, the Panel Van for privacy or the Dual Liner. The Dual Liner comes with twin sliding doors (featuring heavily tinted privacy glass) with two seats up front and three in the back. The seats can easily be removed for carrying larger loads (or sleeping!). There’s a choice of two engines in the Vito Sport, the 116CDI with 163bhp or the more punchy 224bhp. Ours featured the 116CDI 163bhp, and at no point did it feel like we needed more power. 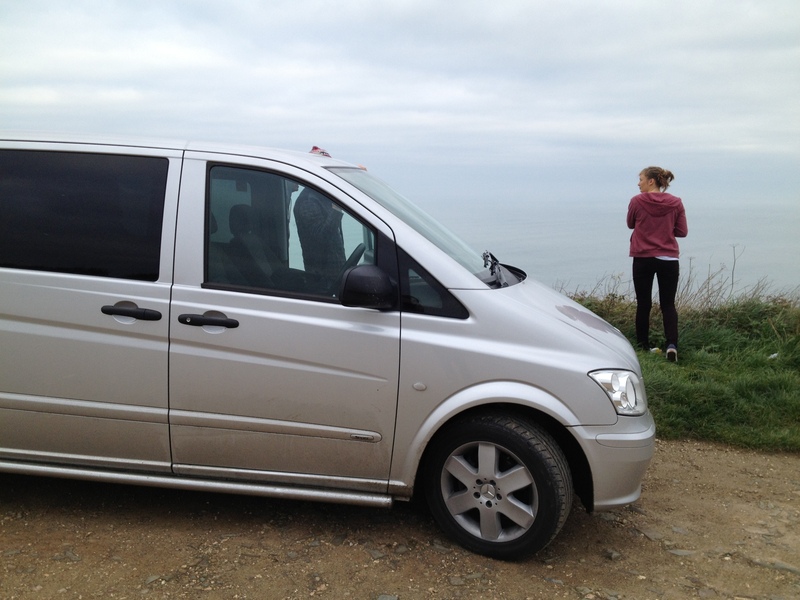 The Vito Sport is rear wheel drive, and as surfers and surfboards tend to be featherweight cargo you can have some fun with spinning the rear wheels – which is amusing in gravel car parks but also lead to one interesting incident on a wet hairpin bend during a steep climb in North Cornwall. The power delivery of the 116CDI is smooth; it doesn’t suffer from being too peaky like some Turbo Diesel engines and there is no lag – you can stamp your foot into the carpet safe in the knowledge that the van will shift. Although we only had surfers and boards inside the Vito Sport for the duration of our trip, the van returned a healthy 36.5mpg. 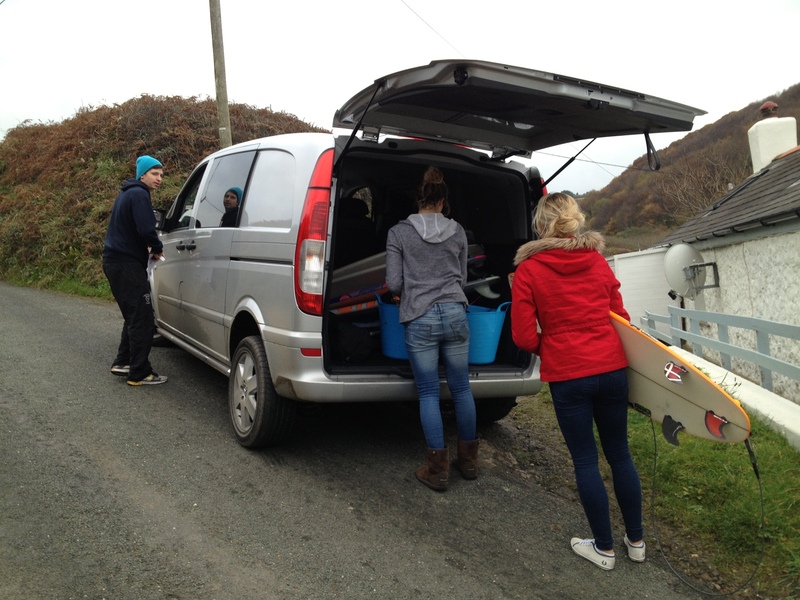 It was driven in the usual ‘surf trip’ way, erattic and excited on the way there and slow and relaxed on the way back! It drives in a very ‘car like’ manner, however the lack of rear visibility due to a windowless tailgate is a simple reminder that you’re driving a van. There are other perks such as electric windows and a good stereo; plus the handling is great and it’s easy to park. 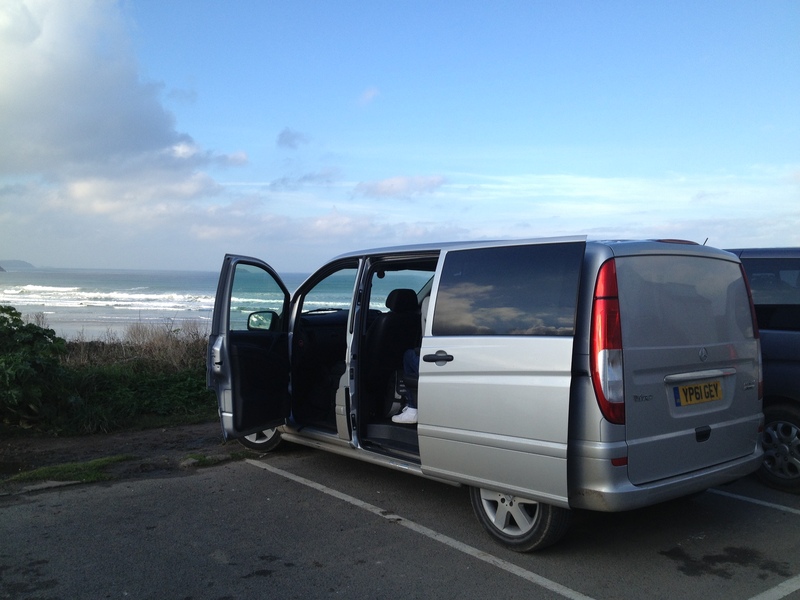 The interior is well equipped, comfortable for five adults and big enough to hold surfboards up to 6’3 ish diagonally laid flat in the load bay without any trouble. The rear tailgate works better on a surf van than dual opening rear doors despite the extra space required for parallel parking; when open wide it makes an excellent umbrella to change under during a downpour! Overall we found this van a great compromise between the luxury comforts of a car and the all round practicality of a van. During our time with the Vito Sport we did find one annoying feature – the handbrake. Anyone who’s driven an automatic Mercedes before will know that the handbrake is replaced by a footbrake mounted on the left side of the clutch, with a pull handle release placed at the lower right of the dashboard above the drivers right knee. The handbrake can’t be released gradually, you simply yank the lever and with a heavy ‘clunk’ the brake disengages. This system works fine in an automatic vehicle, where generally your foot is on the brake as the handbrake comes off… but our Vito Sport had a manual gear box! We discovered how annoying this can be after we’d parked nose first, on a steep downhill, right in front of another vehicle on a wet North Cornwall road. To get out of a spot like this, the driver has to place all his faith in his ability to find the bite point of the clutch and release the handbrake at the exact moment the wheels find traction. 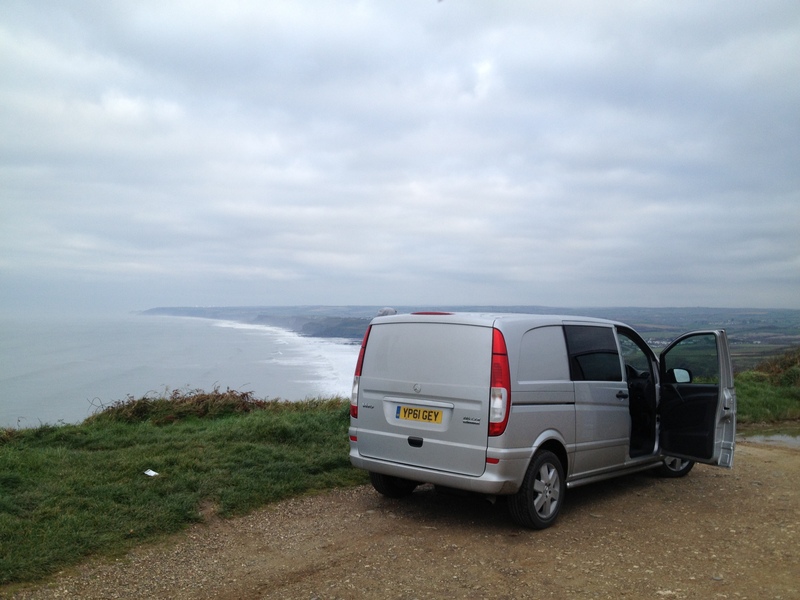 In the lightweight Vito Sport, only loaded with fiberglass surfboards and wetsuits, hill starts on wet Cornish roads took a bit of practice and a sometimes a lot of tyre smoke! What’s it like for a surfer? Overall, brilliant. It drives like a car, is economical, plenty fast enough, full of toys and as vans go; pretty good to look at. We’d like to try the 224bhp version but with light cargo and wet roads the 163bhp engine is more than adequate. There’s plenty of space for surfboards and the heaters are excellent, basically, it’s got everything the modern surfer needs and feels well thought out. There are plenty of vans on the market, so we’re not going to list them all here, and lets be honest – most of them are ugly. The Vito Sport is specifically aimed at the action sports market, it’s main competitor is the Volkswagen T5, but aren’t you all bored of those by now?! ← Private Numberplates – What’s the fuss?